I found this brass Indian pendant at a little import store in about 1971. I've had it all these years, and when started making jewelry, I decided to pair it with some beads to create a necklace. 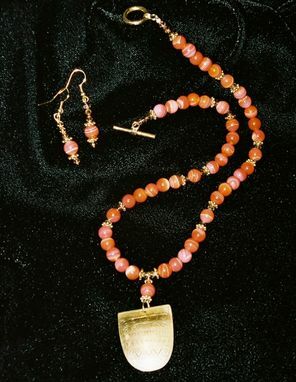 These are carnelian beads (a natural red-colored stone) strung with gold-plated spacer beads and clasp. Earrings are made with same carnelian beads and spacers with gold-filled ear wires. This is a one-of-a-kind piece, but I could recreate it with a similar pendant.